It’s normal to make your first decisions carefully and thoughtfully. After all, being newly promoted or hired means upper management will keep a close eye on you for awhile. That’s fine. And certainly your first or second personnel change will come under rather close scrutiny. The successful supervisor or manager makes personnel changes carefully, keeping at least the next higher level in the loop throughout the process. In fact, most of the truly tough decisions you’ll face are people-problem decisions. Certain issues can doom a new supervisor or manager to failure, such as being unwilling to confront poor performers positively and help them improve or move on, or ignoring interpersonal disagreements and conflicts. And while the toughest decisions are often people issues, they can also involve equipment, systems, or process problems; new product/service decisions; or other issues posing risk to your team or the organization. Making decisions and solving problems are part of the deal when you become a supervisor or manager. Just goes with the territory. 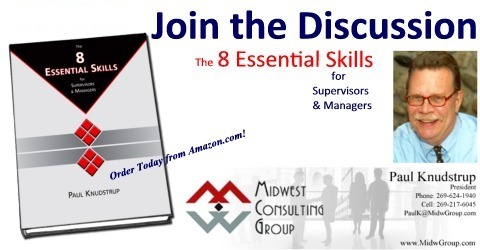 We cover a wealth of information on navigating that territory in Skill 6 of The 8 Essential Skills for Supervisors and Managers – due out in June. Supervisors and managers make decisions – lots of decisions – every day. Most of the time those decisions are made more or less automatically; we make choices almost without thinking. That’s fine for many routine issues, but other decisions require careful thought. They carry the potential for far-reaching consequences; you need to consider alternative approaches, weigh the options, and then make the decision carefully. Problems crop up every day. Some can be solved based on your previous experience. Other problems are not routine, but they’re fairly simple and the correct solution is obvious based on common sense. Still others are simple, there are several workable solutions, and which alternative you select really doesn’t matter much. But as your responsibilities increase, you will face complex problems that require more sophisticated problem-solving and decision-making skills. In addition to the more objective, logical techniques and skills typically associated with problem solving, you’ll need to use your own intuition – your “gut feel” for what the best choice might be in any given situation. If you want to be truly successful as a supervisor and manager, you must develop and practice your problem-solving and decision-making skills. What do you think? What kinds of problems do you deal with as a supervisor or manager? How do you go about solving them and what kinds of results do you get? Do you have a perferred method for making decisions? What works for you? Solving Problems & Macking Decisions is surely one of The 8 Essential Skills.